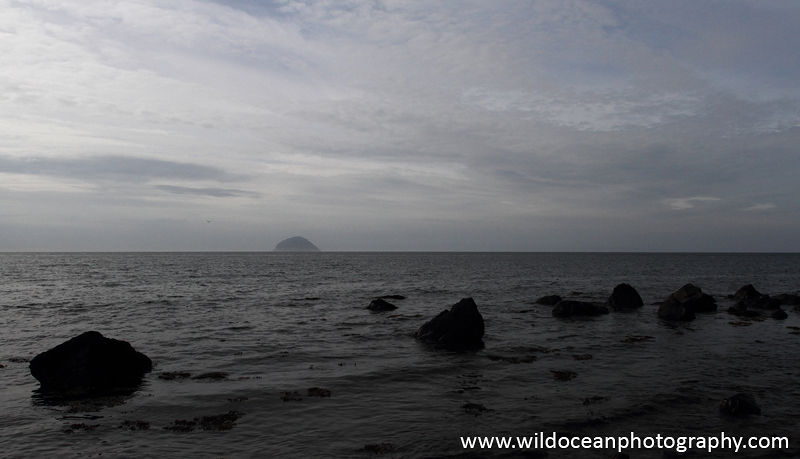 The view out to Ailsa Craig. After exploring around Rockcliffe, we drove out west to the Ayrshire coast. The road from Stranraer to Girvan follows the shore very closely, and has plenty of large parking places which make it really easy to stop and have a look around. I've found this stretch of coastline to be pretty good for seabirds in the past, and it didn't disappoint this time around either! We stopped at Carleton Bay, close to Lendalfoot. The bit we stopped in this time was close to Lendalfoot at Carleton Bay - if you follow the signs for the Russian naval memorial you'll find it. Being relatively close to Ailsa Craig, it's also usually a good area to look for gannets, and this time was no exception. This is a composite image (obviously. No-one gets this lucky! 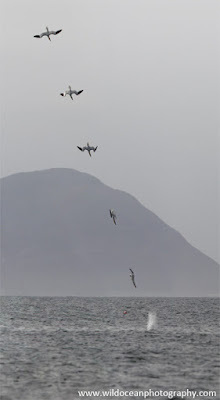 ), of a gannet diving just off the beach. It took longer to make than I'd like to admit! 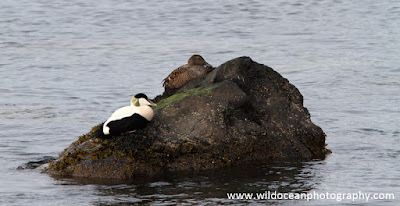 Of course, early summer is also the time when eider ducks breed, and usually hatch their chicks in late May - early June. This is a lot earlier than most of the other seabirds will be hatching their chicks, so if you go to any of the big seabird colonies like the Isle of May or the Farne Islands, they can be easy to miss if you're not on the ball. Anyway, eider ducklings have been on my photography wishlist for a while now, and I was pretty pleased to find that there were quite a few groups of them around this patch of coastline, and pretty delighted to spot the little ducklings in amongst the adults! Eider ducks fighting about something while a bunch of seals look on in the background. So delighted that I didn't actually notice there were a group of common seals basking just offshore until I looked at the photos later on my computer! An eider duck family settling in for a nap. The duckling is just visible underneath its mum (the brown one). Eventually, one pair of eiders came into the shore with a chick and settled down in a rather photogenic fashion for a snooze, and I finally got my first decent photo of an entire eider duck family! An oystercatcher exploring the shore. Of course, that's not all there was to shoot. 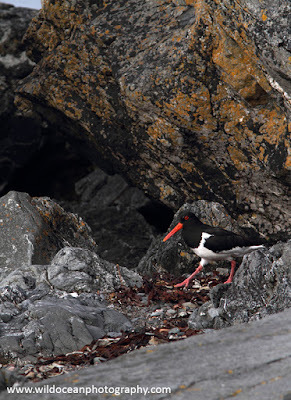 A group of shags were making good use of an exposed line of rocks to rest on for the evening, and a rather bold oystercatcher was happy to pose for a few photos before wandering off again! There's dolphins off the starboard bow!